(0 Customer Reviews) | Write Review 6 issues per year Global Franchise magazine is the only journal dedicated wholly to international franchising. If you’re interested in becoming a master franchisee or regional developer, or if you want to expand your franchise overseas, Global Franchise is the title for you. 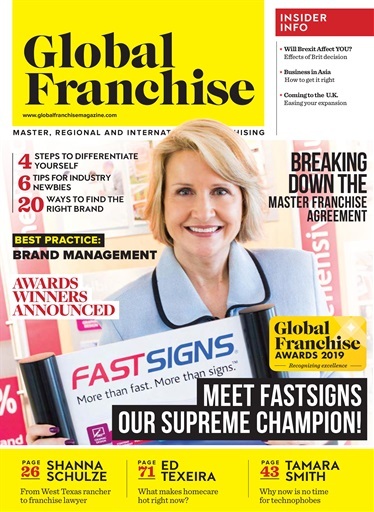 Written by experts in international franchise, each of its issues is packed full of information, advice and interviews with industry leaders, plus dozens of opportunities for a would-be master franchisee looking to buy his/her perfect brand. Results of the 2019 Global Franchise Awards! Special feature on the awards presentation in Las Vegas. Profiles of the Supreme Champion and a category winner. How well do you know your master franchise agreement? 20 Unbeatable reasons to expand to the U.K. Will Brexit affect you? 4 ways to differentiate your franchise. 7 steps to find the right brand for you. 3 tips for franchising newbies. All about disclosure. What's new at IFE New York this year? Multi-unit franchising – a case of the more, the better? Guide to franchising in the U.K. How to successfully take a franchise to Asia. Global Franchise magazine is the only journal dedicated wholly to international franchising. You'll receive 6 issues during a 1 year Global Franchise magazine subscription. You'll receive 6 issues during a 1 year Global Franchise magazine print subscription.